Red-eyed tree frogs, as their name states, have bold red eyes with vertically narrowed noses, a vibrant green body with yellow and blue striped sides, and orange toes. There is a great deal of regional variation in flank and thigh coloration. Although it has been suggested that the frog’s bright colors function as sexual signals, neither of these hypotheses have been confirmed. Males range from 2 to 2 1/2 inches, while female range from 2 1/2 to 3 inches on average. Young frogs are typically brown in color and turn greener as they mature, adult frogs can change their color slightly depending on mood and environment. The Red-eyed tree frogs have soft, fragile skin on their belly, and the skin on their back is thicker and rougher. The red-eyed tree frog has three eyelids and sticky pads on its toes. They are arboreal animals, meaning they spend majority of their lives in trees, which also makes them great jumpers. 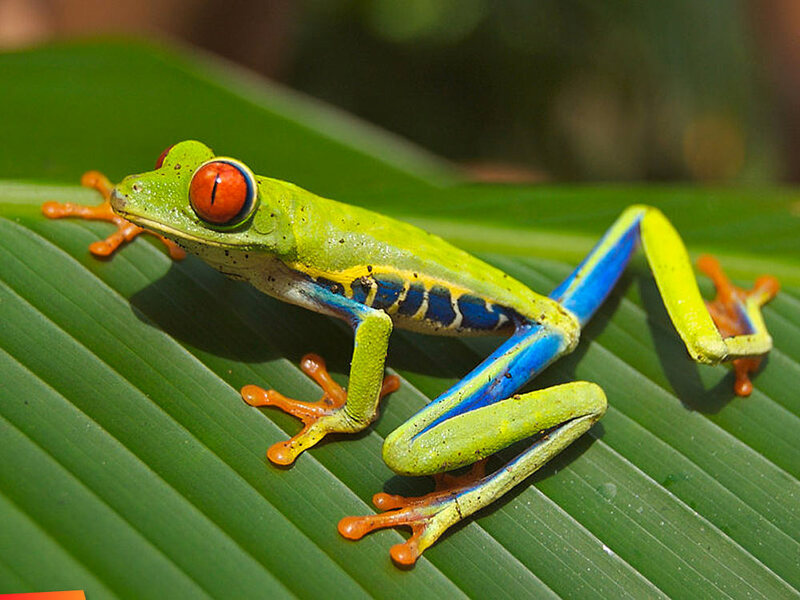 Red-eyed tree frogs are not poisonous and rely on camouflage to protect themselves. During the day, they remain motionless, cover their blue sides with their back legs, tuck their bright feet under their belly, and shut their red eyes. Thus, they appear almost completely green, and well hidden among the foliage. Red-eyed tree frogs are carnivorous and eat crickets, moths, flies, and other insects, and have been known to eat other small frogs. For froglets, fruit flies and pinhead crickets are the meals of choice. During the mating season, when rainfall is at its highest, males of the red-eyed tree frog call (“chack”) to get the attention of the female, who then caries him on her back around for up to several hours during the opposition process. The female chooses a leaf above a pond and lays her eggs, called a clutch. The eggs develop into small tadpoles , which hatch after several days and fall into the water below. Dragonflies, fish, and water beetles prey on the tadpoles. They remain in the water anywhere from 3 weeks to several months, until they develop into frogs. Snakes, spiders, bats, and birds of the rainforest are predators of this frog. After full development weeks later, the juveniles that survive the first few weeks crawl back into the undergrowth and security of plants in the vicinity of these pools, often in the hollows of tubular plants like bromeliads. Juvenile specimens prey on very small flies and insects during the first months of their lives. The young mature after 2 years and begin mating at the age of 3–4 years. These frogs are known to live as long as 5–10 years (data from captive breeding programs), depending on the health and conditions of their habitat (i.e. abundant plant growth, plenty of fresh water and abundance of small and larger insects to prey on). Red-eyed tree frogs are closely related to Chorus frogs, which have the same body style and many of the same habits, though chorus frogs are more vocal.